The ImageXpress® Nano Automated Imaging System enables researchers to get better data faster allowing researchers to scale up their experiments to multi-slide or microplate-level evaluations. The system features a long life, solid state, light engine and optics to reliably deliver the right assay sensitivity. The user-friendly software interface is easy to learn and provides the ability to remotely configure, run acquisition protocols and review analysis results. The imaging system can be configured with preferred filters and objectives. Additional options include transmitted light capability for imaging of non-labelled samples and sample incubation (temperature, humidity, CO2) provided through Molecular Devices environmental control feature. 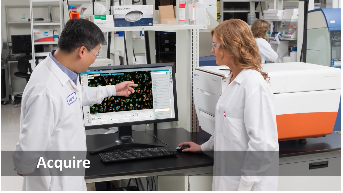 The ImageXpress Nano system can be accessed and data gathered online with the browser-based CellReporterXpress™ Automated Image Acquisition and Analysis Software which comes with 25 predefined analysis protocols and simple, linear workflows to get started quickly. The ImageXpress Nano system through a unified workflow, streamlines automated imaging, offering a simplified solution for scaling up microscopy. The software includes distributed analysis of images for increased throughput. Predefined analysis protocols provide most common biological assays while still allowing users to create and save their own protocols. Label-free transmitted light cell analysis is available through pre-defined algorithms designed to automatically identify objects in bright-field including small round cells, large cells and beads. The Click to find feature auto calculates object parameters based on user-selected cells of interest, simplyfing analysis setup for complete assays, Linear plate and microscope slide workflows simplify configuration of image acquisition and analysis with an easy to navigate icon menu. Side by Side CellMagnify technology allows zooming or pan-high resolution images from whole-well view down to cell-level view. Images can be compared from two wells either independently or simultaneously. The Cell gallery allows one to easily navigate back and forth between a whole plate or slide, and individual cells of interest with the touch of a button. 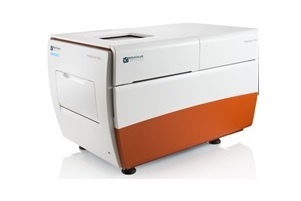 The ImageXpress Nano System and the CellReporterXpress software has demonstrated its high effectiveness in the high-throughput screening of multiple chemicals for cardiotoxicity, thus allowing identification of cardiotoxic drugs early in drug development. Fully automated X, Y and Z stages with resolution better than 100 nm.